The name ‘Oyster Shack’ and the rather interesting menu online rather gives one the impression that the place will feature plastic chairs and lots of Formica but, really, it isn’t like that all. It is fairly small, but it has two floors and the ground floor, where I sat, would, I would say, seat 60 or 70 guests. It is comfortable with simple décor, and done up in a vaguely marine theme with pictures of oyster farms and fishing boats adorning the brick walls along with a stuffed Marlin. The only aspect of the setting I didn’t care for was the fact that a there was a radio tuned to a talk show playing in place of music. Luckily, it wasn’t so loud as to be especially annoying. I arrived just as the doors opened for lunch and I was the first patron, although a number of others showed up and there were about a dozen or so other guests by the time I finished. My waiter was a very chatty and pleasant young man who enjoyed talking about the food and, during my stay, the service was fast and attentive without being too obtrusive. 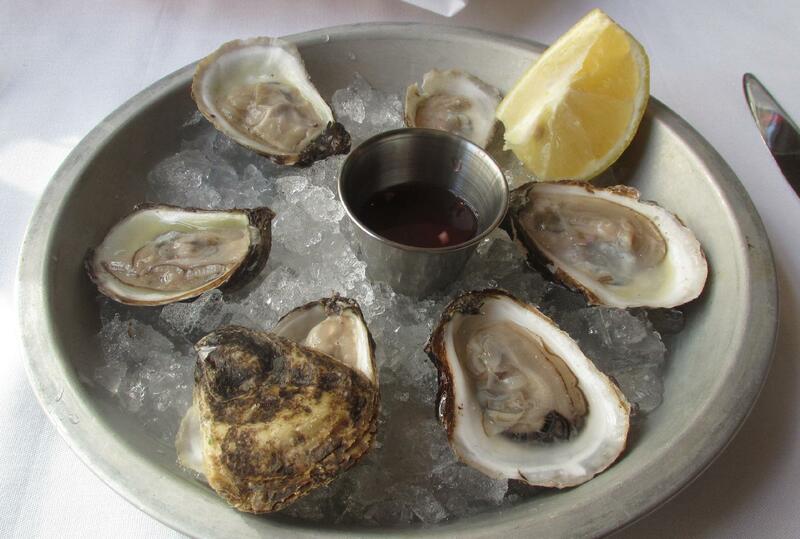 As one would expect, the restaurant carries a selection of fresh oysters that vary with available supplies and there are many other seafood restaurant specialties such as clam chowder, crab-cakes and fresh lobster. There are also some non-seafood selections, steaks, burgers and chicken, and a couple of novel items such as ‘Lobster Mac and Cheese’ and a ‘Blackened Salmon and Bruschette’. It is not cheap, especially, but then, for downtown Montreal’s Golden Mile, it is not particularly expensive either. 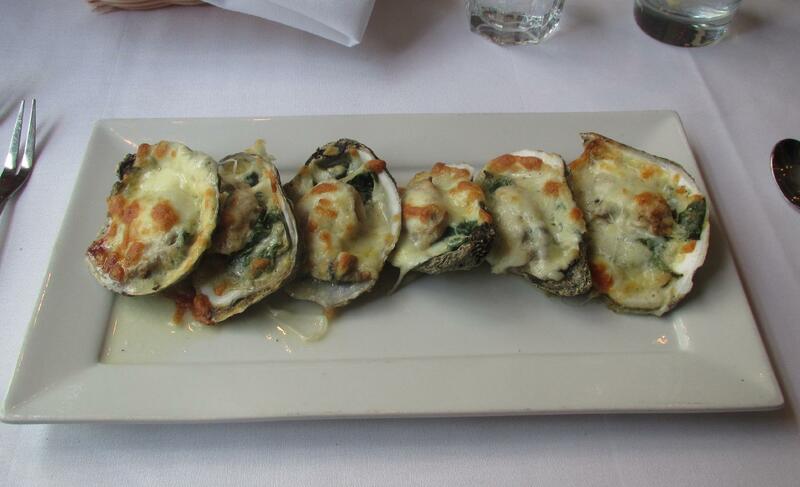 Oysters Rockefeller – I have actually never had this classic dish before and, though this selection was delicious, I still not sure I have had it yet. As I understand it, the genuine article calls for Oysters topped with a variety of herbs (the original mix is a closely guarded secret), a dash of Pernod or Herbsaint, and topped with breadcrumbs before being baked or broiled. This version however, used Spinach (which is quite common these days, I gather) but other than possibly parsley, there was no other taste of herbs. I fancied in one mouthful that I caught a hint of anise but it was so fleeting that I am not sure if any Pernod, or other substitute was used. The other departure from the classic preparation was that the oysters were topped with chees rather than breadcrumbs but, even though this might not be traditional, I think I prefer this on the whole. In any event, though this may be a very loose interpretation of Oysters Rockefeller, it was still very good. The oyster used were Malpeques according to my waiter and they were a good size and very meaty. The liquid thrown off by the spinach blended very nicely with the natural oyster liquor and I like the way the browned crispy bits of chees added to the taste and texture. I rated this at a solid 4 out of 5. On this particular visit, the menu listed 9 varieties as being on offer… 6 from PEI, 2 from New Brunswick, and the last from Massachusetts. I would have preferred a slightly more wide-ranging selection and was rather disappointed that the west coast wasn’t represented at all. There were three names I didn’t recognize, all from PEI, but one sort, the ‘South Lake’, had apparently not yet been delivered that day. I ordered 6 of three different varieties. The ones you see pictured above are the Pearl Cocktail type from PEI. I will spare you pictures of the others I had as they all looked pretty much the same. All the plates came with a lemon squeeze and a simple Mignonette but, to my surprise, there was no Horseradish (which is very unusual), nor any type of hot sauce. I didn’t mind this though as I never adulterate fresh oysters, not even with lemon. Pearl Cocktail (PEI) – These were moderately briny at the start. This faded quickly, however and the rest of the experience was bland with only a few grassy, cucumber notes at the finish. The texture was flabby and not very good, with there was a milky quality to the liquor you sometimes see in oysters during the reproductive cycle. They weren’t bad but only rated a bare 2 out of 5. Gooseberry (PEI) – These were better than the previous ones. The usual sharp brininess of PEI oysters was very noticeable at the start and there were even a few brassy notes of copper and iodine. The body was a little flat but some sweet notes at the end saved this from being disappointing and the general effect was crisp and pleasant, I gave these a 3 out of 5. Wianno (Massachusetts) – These were the best of the lot. The shells had a nice deep cup and there was lots of liquor. The brine quality was quid mild, even at the start, but it persisted and developed into some lovely honeydew melon highlights with an unusual but very pleasant underlying taste that was reminiscent of the aroma of fresh-cut hay. I rated them at a solid 4 out of 5. 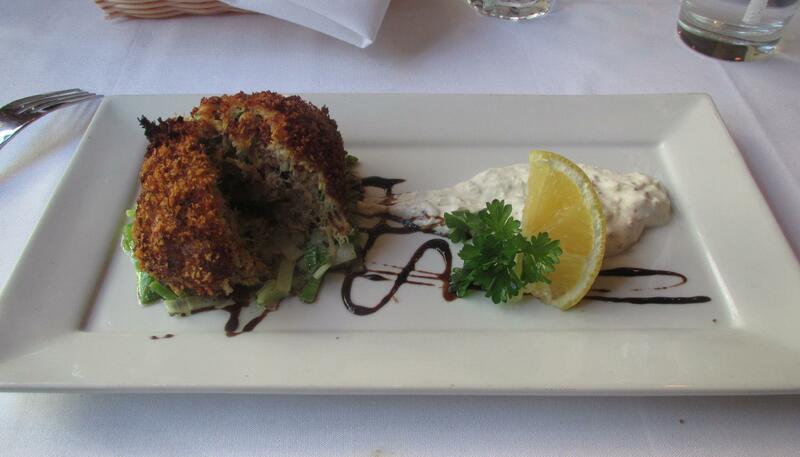 Crab Cake – This was a bit unusual. Rather than a couple of patty-type ‘cakes’, I got a single sphere that was almost as a big as a tennis ball. It was served on top of a bed of sautéed leeks with a drizzle of Balsamic Vinegar, and there was a white sauce alongside that I first took to be some sort of Tartar Sauce but which turned out to be something closer to a Tzatziki. The balls were made from crab meat that was shredded way too finely and there were flecks of scallion, parsley and red pepper in the mix. The texture was not very good (the sheer size of the balls is a mistake, I think), and although a little of the crab sweetness came through, the taste was largely bland and only helped by the Balsamic. I like the leeks (indeed I will borrow this idea myself in future) but the white sauce, whatever it was, did not work well at all. I wasn’t especially impressed with this selection but I was pleased to have sampled it and gave the effort a (somewhat generous) 3 out of 5. 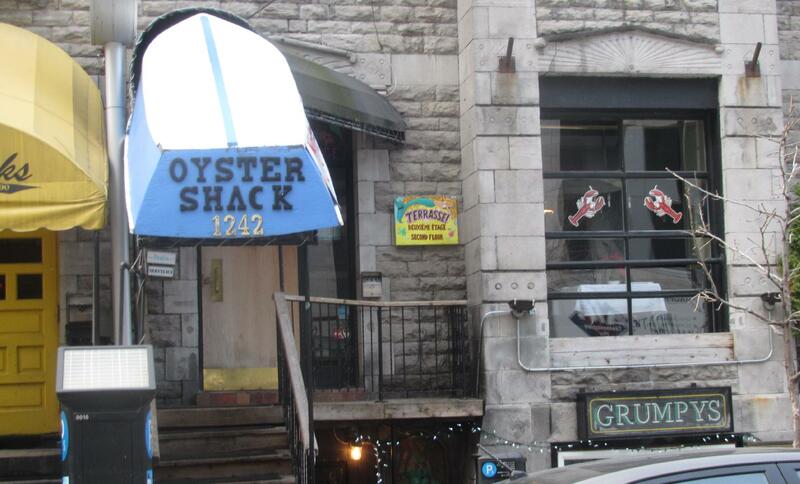 Although I was a little disappointed that the oyster selection largely featured Maritime Province varieties, I enjoyed my visit here and was pleased with the friendly service and pleasant surroundings. There are some items on the menu I would like to try sometime and I will return on future visits to Montreal. Rating: 4 out of 5.